The migration patterns of the emperor penguin create a glorious spectacle. The birds repeat the behaviors performed by generations of ancestors. These majestic penguins travel every year to reach preprogrammed, inland spots for nesting. Migration, such as this penguin ritual, allows animals to move from place to place to meet survival needs. Like the migration of birds who fly south for the winter, Emperor penguins migrate every year. The emperor penguin, the largest of the world’s penguin species, is best known for its migration behaviors. Specimens stand almost 4 feet tall and weigh up to 90 pounds. Emperor penguins begin their migration rituals each March, traveling up to a hundred miles to reach their nesting grounds. Like magic, Penguins living throughout Antarctica migrate at the same time, and colonies of penguins arrive together to claim their ground. Each female will lay an egg, and the males take care of the eggs for the next four months. Meanwhile, the females trek back to the sea, where they can find food. The first penguin eggs hatch in August, and the fathers provide a curdlike food from their esophagi to support the chicks for about two weeks. Then the females return to care for the young chicks. The males, who have withstood ice and cold throughout the harsh Antarctic winter, are relieved from their egg-sitting duties to head to the sea to feed. The females regurgitate food for their babies until they can no longer produce. Then they head back to the sea to refuel, leaving the chicks alone to wait for the males to return. Soon the males reappear, nourished and able to feed the chicks. Interestingly, penguins recognize and feed only their own chicks, and the males find their babies by listening for distinctive calls. Parents take turns feeding the chicks and returning to the sea to feed themselves. The migration tracks are traveled over and over by both parents for about nine months. When summer arrives and the chicks have matured in December, they travel with their parents to the sea and learn to swim for their own food. The chicks remain at the breeding grounds at sea until they mature, at about 4 or 5 years of age. When they find mates, they repeat the migration patterns of their ancestors. Little is known about how penguins find their way during migration, but scientists have concern for the future. A few other penguin species, such as the Magellanic and the Humboldt penguins, migrate for the purpose of finding food, but the instinctive travels of the emperor penguins are legendary. 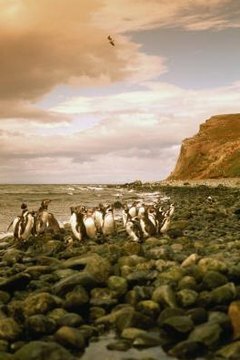 The film "March of the Penguins" provides a clear picture of penguin life on our southernmost continent. Emperor Penguin Migration: How Do Animals Find Their Way?